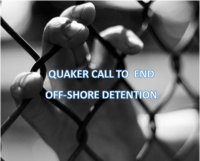 Quaker Australia Press Release – End Off Shore Detention of Refugees! Quakers in Australia issued the following media release outlining letters written to the Prime Minister and Leader of the Opposition calling for the end to off-shore detention of refugees. Australian Quakers call upon the Federal Government and Opposition to act immediately to end off-shore detention of refugees and bring those held on Nauru and Manus Island to Australia for resettlement and healing. Presiding Clerk of Australia Quakers, Jo Jordan, in letters to the Prime Minister and Leader of the Opposition, says that the latest Amnesty International report about conditions on Nauru is consistent with all previous reports about the suffering of asylum seekers and refugees in off-shore detention. The policy has failed to meet basic humane standards and has compromised Australia’s stated commitment to international refugee law and practice. “Quakers believe that the Federal Government and Opposition need to separate their ‘stop the boats’ approach from the treatment of refugees and asylum seekers in off-shore centres. It should be possible, with appropriate negotiation with Indonesia and Malaysia, to ensure that people smuggling is not encouraged and that an orderly processing system is put in place in co- operation with UNHCR. At the same time it should be possible to accept that the people on Nauru and Manus should not be hostage to a policy of deterring others, and that they deserve compassionate treatment and support by Australia. “I appeal to the Government and Opposition leaders to take the necessary steps to end the enormous human and financial cost of off-shore detention, and to acknowledge the harm done to the people left there indefinitely. I further ask that appropriate measures be put in place, in consultation with NGOs like us, to enable those people to resettle in Australia and become able to contribute to our community”.